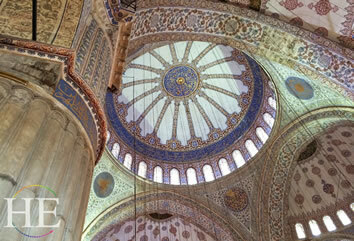 Istanbul, Ephesus, Bodrum, Turquise Coast, Antalya, Konya, Cappadocia, and more! Turkey: the only country that occupies two continents. Turkey: a land of so much diversity of seacoasts, mountains and plains that it could be one continent by itself. Turkey: home to well-preserved archeological sites that show the vast expanse of the ancient Greek and Roman empires. Turkey: a cradle of Christian civilization harking back to the days when Istanbul was called Byzantium and Constantinople. 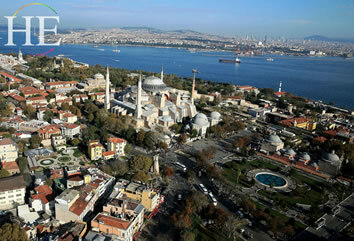 Turkey: home to the Ottoman Empire that extended far beyond the borders of today’s nation. Turkey: a primarily Muslim country in which secular government has long been enshrined in its constitution. 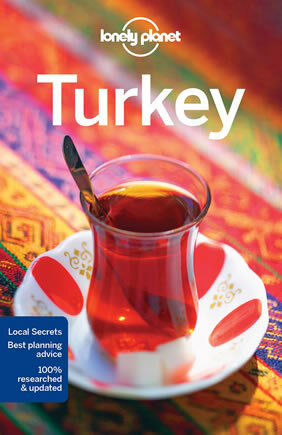 Join us to explore this amazing land with our articulate Turkish guide! 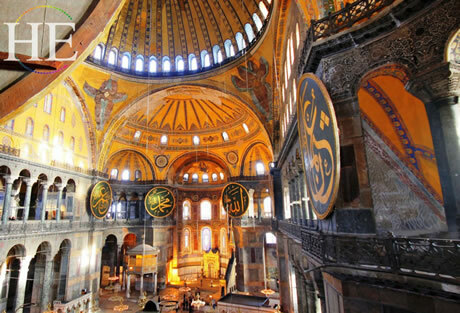 • Tour Hagia Sofia, the Blue Mosque, Topkapi Palace and the Grand Bazaar in the city known as Istanbul, Constantinople and Byzantium. 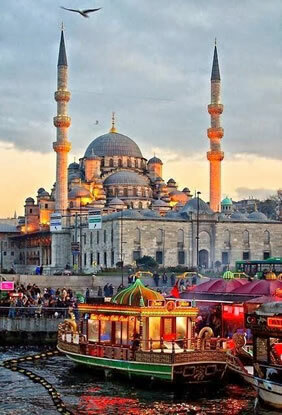 • Take in vistas of Istanbul from a cruise along the Bosphorus. 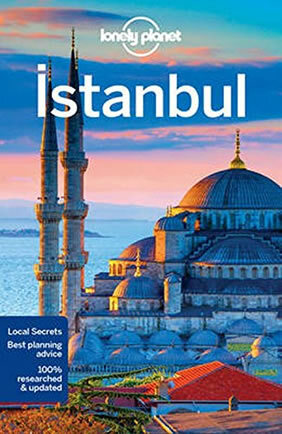 • Be dazzled by Istanbul’s dizzying nightlife. • Experience a traditional Turkish bath (hamam). • Explore Ephesus, one of the largest and best-preserved ancient sites in the world. • Relax on a comfortable Turkish gulet ( yacht) for one full-day cruise and one half-day cruise to experience the variety of landscapes along the Turquoise Coast. • Walk through history at Myra, Perge and Aspendos near Antalya. 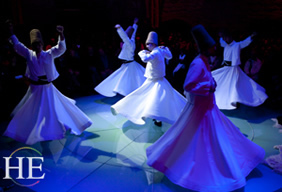 • Visit the home of the Whirling Dervishes in Konya. 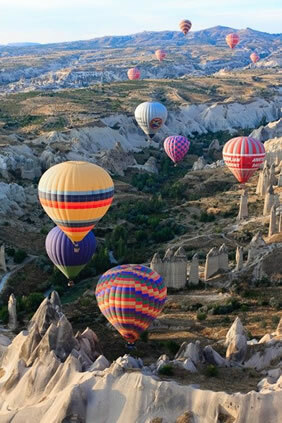 • See the otherworldly sandstone formations and forgotten cave churches of Cappadocia. • Extend your stay and visit Italy or Puglia. An exquisite gay cultural tour of Italy with a congenial gay group exploring the Amalfi Coast, Capri and the enchanting regions of Basilicata and Puglia. We’ll delve into the history of Pompeii, and delight in the natural splendor of the region, admiring the tenacity with which ancient residents settled the cliffs and islands of the Mediterranean. After arriving in Istanbul and checking into our hotel during the afternoon of Day 1, we meet with our tour guide, and take a short walking tour of the area near our hotel. Tonight we’ll enjoy a welcome dinner and orientation. We’ll spend the next two days exploring the city, which is dramatically situated upon three waterways: the Bosphorus, the Sea of Marmara and the Golden Horn. Istanbul’s exotic flavor comes alive in its magnificent mosques with their minarets, the bustling bazaars, and along the boulevards and bridges. We’ll have ample time to soak in the atmosphere of the city and enjoy its many exciting vistas. We’ll start at Hagia Sophia, known for its magnificent dome, then tour the Sultan Ahmet Mosque, more familiarly known as the Blue Mosque, with its magnificent paneling of over 20,000 blue Iznik tiles. After lunch on our first full day in Istanbul we’ll wind down with a visit to a traditional Turkish Bath (hamam). There will also be time to shop at the Grand Bazaar, exploring a labyrinth of streets and passages where more than 4000 merchants will vie for our attention. No stay in Istanbul is complete without an unforgettable boat excursion through the Bosphorus, the winding strait that separates Europe and Asia and connects the Mediterranean and Black Seas. We start our second full day in Istanbul with a boat ride, then after lunch we’ll take a leisurely visit to the Topkapi Palace museum, former residence of the Ottoman Sultans. This maze of opulent buildings where the sultans and their courts lived and governed is now a rich and fascinating museum filled with Chinese porcelain and extraordinary jewelry. This morning we will take a short flight from Istanbul south to Izmir (included in the price), then drive to the ancient Roman site of Ephesus, one of the largest and best-preserved ancient cities in the world. A walk down the well-preserved wide marble streets lined with columns offers the vision of the ancient Hellenistic and Roman empires, complete with theaters, temples and baths. After touring Ephesus we’ll have lunch at a local restaurant, then drive to the resort city of Bodrum, our home for the next two nights. The city boasts the medieval Bodrum Castle, built by the Knights of Rhodes, and housing the Museum of Underwater Archaeology. Halicarnassos Mausoleum, one of the Seven Wonders of the Ancient World, was also in Bodrum. In contrast to our busy day the day before, we devote a day to relaxing on an all-day ride on a gulet, a charming and comfortable wooden sailing vessel. We’ll have lunch on board, then return to Bodrum for the night. The following day we will drive to the port city of Fethiye, one of the best sailing harbors of the Mediterranean, where we will have lunch. We will then drive along the coast to Kalkan, one of the most beautiful locations along Turkey’s Lycian Coast. We’ll have dinner at a local restaurant overlooking the bay, and spend the night in a seaside boutique hotel. We’ll reprise our Turquoise Coast sailing with a half-day gulet ride this morning from Kalkan along the coast to Kekova, where we disembark and have lunch. After lunch we explore the ancient site of Myra, then continue on to Antalya, founded by Attalus II, King of Pergamum, as a port city in the 2nd century BC. We will stay in the heart of this vibrant city for two nights. We’ll have a buffet dinner at our hotel, then our guide will take us on an Antalya by Night tour. 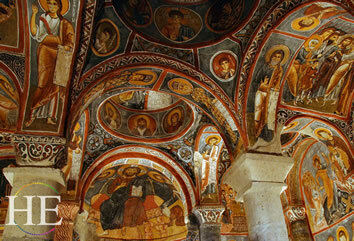 Today we explore the ancient sites around Antalya. Our first stop will be the ancient city of Perge, which was founded after the Trojan wars, and was first mentioned in 334 BC when Alexander the Great passed through. Later Perge was where the apostle Paul and Barnabus began their first mission in Anatolia. Renowned for its schools of sculpture during the Roman period, Perge was also important because of its strategic location on the Pamphylian plain, linked to the Kestas River by road but far enough from the sea to be safe from pirates. Further along, the ancient Pamphylian city of Aspendos is noted for its Roman and Byzantine ruins, and in particular a well-preserved Roman theater. A wide range of coinage from the 5th century BC onward attests to the city’s wealth, which was based on trade in salt, oil and wool. Aspendos was occupied by Alexander the Great in 333 BC and later passed from Pergamene to Roman rule in 133 BC. In the afternoon we’ll leave some time to swim or enjoy our hotel’s spa, then we’ll have dinner together at one of Antalya’s famous restaurants tonight. Day 9 - Do All Dervishes Whirl? After breakfast we drive north for about four hours over the impressive Taurus Mountains to Konya, home of the Whirling Dervishes. The Sufi Mevlana Celaleddin Rumi, founder of this unique Islamic group and a great Turkish poet and mystic, is buried here and consequently Konya has become a holy place of pilgrimage. We will have lunch upon arrival in Konya, then in the afternoon we will tour the city, including a visit to Mevlana Museum to see the cells of the dervishes, fine drawings by famous calligraphy artists, and the tombs of the Sufi and other male dignitaries. Most tourists get a quick glimpse of the Sufi tradition then move on, but we are going to slow down and spend one night here so that you will have a chance to see what makes this unique spiritual center so special. From Konya we drive across the central Anatolian plain to Cappadocia, where we’ll check into our hotel and have an orientation of the area. Over centuries, soft volcanic rock has been sculpted by wind, rain, and erosion into magnificent columns and fantastical shapes, creating one of the most interesting landscapes in the world. Our first afternoon in the Cappadocia region we will descend to the remarkable underground city of Derinkuyu. In the 2nd century AD, as armies swept across Asia Minor, the residents of Cappadocia created uniquely defensible communities by digging approximately eight stories down into the volcanic tufa stone. This unusual subterranean development is nearly as eerie as the above ground formations we have seen. We will ascend from Derinkuru for lunch, then go to the Caravanserail to see a Whirling Dervish ceremony. After the ceremony we’ll check into our unique lodgings at a cave resort, where we will have first-hand experience of the unique characteristics of cave dwellings. We’ll conclude our tour with a three-night stay in this other-wordly destination. 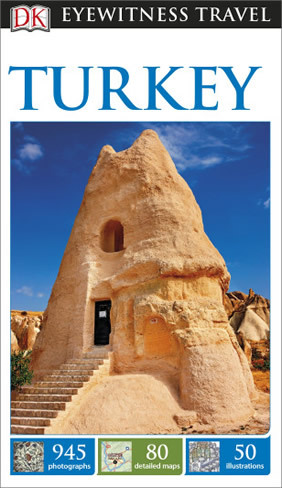 The next day we’ll visit the open-air museum of Göreme whose steep cliffs hide many tiny churches dating from the 9th century when Christians fled here to escape persecution. We’ll visit a 180 foot-high fortress carved out of a natural hill dominating the area, for a breathtaking view of the surrounding Cappadocia formations and other sights. 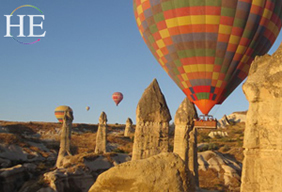 Our last full day in Turkey starts at 5 am for anyone who would like to arrange for an optional hot air balloon ride over the vast sandstone landscape. Later in the morning, we’ll visit the region of Zelve, including the Pasabag Valley, Cavusin and Avanos, where we will have lunch in a cave restaurant. From Cappadocia, we will provide a transfer to the airport for a morning flight to Istanbul to connect with flights home or to your next destination. The closest airport to our hotel is Nevsehir (NAV), but transfers can also be arranged to Kayseri Airport (ASR) (fare to Istanbul is typically about $280). For those who would like to spend more time in Istanbul, our local partners can also arrange transfers and lodging to extend your stay. Savor the bounty of the rich traditions of Italy’s Adriatic coastal region of Puglia. By day explore mountain towns, seaside villages, Swabian castles and cave homes that pre-date the Renaissance. Then each evening relax in our authentic 14th century villa over a dinner featuring produce, meat and fish from the region, and olive oil and wine from the villa’s own fields. • Gratuities for porterage and included meals. To fully enjoy this tour you need to be able to walk around unevenly paved ancient sites for 1-4 hours each day. During the season we visit Turkey, days should be warm with occasional showers. So are most of the people who travel with us. You do not need to pay extra to travel by yourself. Prices are per-person, and the single supplement applies only if you’d like a room by yourself.